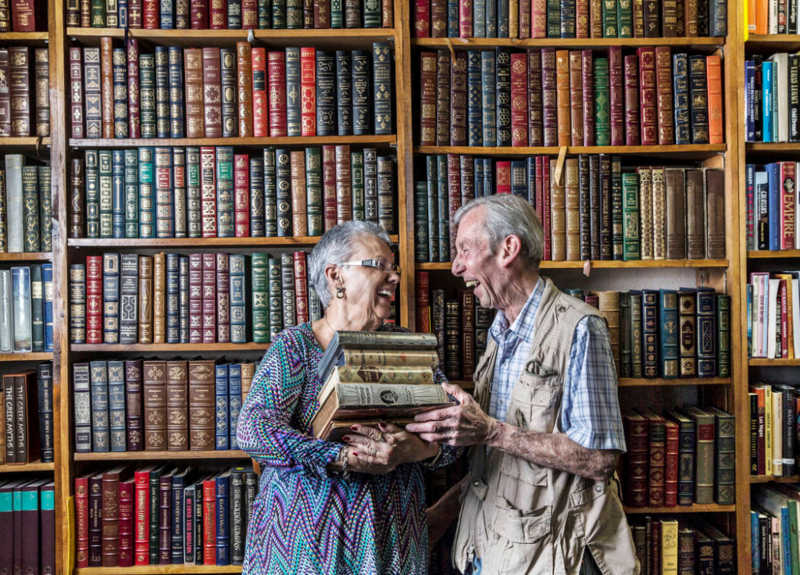 Myrna and Lou Donato, co-owners of the Amber Unicorn bookstore in Las Vegas. Photo by Benjamin Hager. By Woody Bernardi: Lou Donato, longtime Las Vegas resident, sf con huckster, and co-founder, with his wife Myrna Donato, of Amber Unicorn Books, passed away November 8, 2017. I first met Lou and Myrna some 30 years ago when Amber Unicorn was in its original location on W Charleston. Lou and Myrna have been staples in the Las Vegas science fiction community for four decades. They were among the original dealers for Vegascon 1991 which was held at the Palace Station Hotel & Casino over Nov 1-3, 1991. Lou was a huckster at fan-run cons for years even before I encountered Fandom. Lou and Myrna ran dealers tables at cons for decades. They did cons in LV, Loscons, Coppercons (in Phoenix, AZ), Westercons, and Worldcons, including Renovation (the 1st Nevada Worldcon, in Reno). Lou and Myrna also ran several Antiquarian Book Fairs in Las Vegas, at both the Sahara and Stardust Hotel & Casinos and in Southern California. I believe that it was Lou and Myrna who first put me in touch with the Beast Connection, a local fan club for the 1980s Beauty and the Beast TV show. Beast Connection ran three TunnelCons in LV, in the early 90s. They did TCon I at the Sahara Hotel & Casino and TCons II & III at the Stardust Hotel & Casino. I recently came across a PM which Myrna sent me in 2013, when we were working on a new Fan-run SF con in Las Vegas. Unfortunately, we had to cancel that event. But Lou and Myrna were always willing to help where they could to further any Fan Event. Woody, Between 1984 and 1997 Lou and I exhibited at various Science Fiction cons, that includes quite a few WorldCons, Westercons and other [local cons] throughout the Southwest. In the early 90’s we put on 6-10 Antiquarian Book Fairs not only here in Las Vegas, but also in Southern California. These Fairs all had a minimum of 125 dealers exhibiting their books and they came from all over the states, England and Europe. It is difficult for me to imagine a world which Lou no longer inhabits. I’ve been reeling from all the celebrity deaths over the past year or so. The idea that many of the icons of my youth are no longer with us, well I thought those were devastating losses. This, however, hits me far harder since I knew Lou personally. Another longtime friend of mine, in Fandom, passed away just over a year ago. Joyce Worley-Katz and her husband, Arnie Katz relocated to Las Vegas in 1989. It’s my understanding that they went into Amber Unicorn on W Charleston, just over a year later, and it was Lou and Myrna who introduced them to Local Fandom by giving them a flyer for Vegascon 1991. Lou and Myrna have been stalwarts in Las Vegas Fandom and SW Fandom at large for decades and he will be sorely missed by scores, if not hundreds of Fans. Las Vegas Review-Journal reporter John Przybys wrote an article about Donato’s passing in “Amber Unicorn Books co-founder dies at age 77” on November 9. Here’s proof that you have to read fanzines if you want all the news. I learned from Arnie Katz’ latest issue of Claptrap that GalaxyCon, scheduled to be held in Las Vegas this November, has been cancelled — and taken Toner 2 with it.